OMG, I just love Harry's expression! Hermione looks ropeble! God they are so in love. Great art man! Nice imagination! 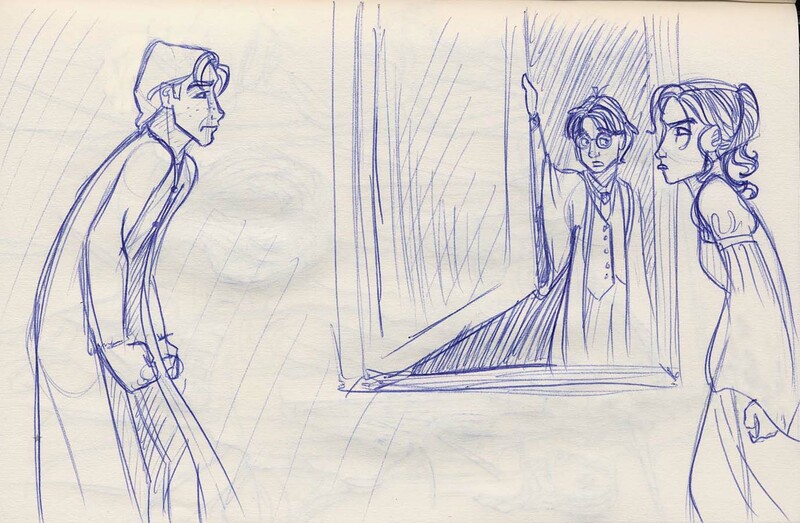 A not% for Godric's Hollow: RON AND HERMIONE ARE NOT IN LOVE. HARRY AND HERMIONE ARE IN ABSOLUTE LOVE. I agree with Aayush Arya--Ron and Hermione are not in love! They fight WAY too much to get together! Eh... Godric's Hollow is right on the spot. UST. I'd rather comment on the artwork itself. Harry is priceless he has that "I am not getting smaller, I am backing away from you" expression. Besides the fact that I am Hemrione/Ron shipper (opposites attract yall!) I just adore Harry's "Don't mind me I was just leaving" express! oops. i apparently cannot type. that should be spelled HeRMione, and it should be expression, not express! Funny how a huge fight can make one think that they belong together! Haha! first off, I LOVE Hermione's expression..
second of all, I dunno, the thought of Hermione and HArry makes me want to barf.. Dunno why. Ron and Hermione are so totally going to get together! I mean, it's sooo obvious that they fight like a married couple! I do believe the artist would much rather like a few comments on the actually work than a shipping war at the moment. Personally, I think a spat between shippers is good fun. Hehe. I love all three expressions, Hermione's the most. It's a cross between pouting and total anger. I can see Harry unconsciously going 'Uhhhhh'. It's great! Ron and Hermione always fight like an old married couple! :) I LOVE the picture. Poor Harry, always caught in the middle. how brilliant is this piccy?! "i'll just be going then....."
ron and hermione are so brilliantly drawn! each pouting at each other like little kids! we really shouldn't bicker about ships but........ron/hermione is so gonna happen! Ha, yours truely is SO right - Harry's expression totally DOES say that. I love Hermione's hair here; it's beautiful. Oh, yeah, and - I think you'll find Drew wants the artwork commenting on, not the ships. It's unlikely that he would have put this up for a shipping debate. The HMS Harmony (harry and hermione) has sunk! Accept it and move on! Great pic, by the way! Keep in mind that most people here commented before the 7th book came out, so no need to get angry anymore. But you should know, Drew hasn't read the 7th book yet, and won't for a while, so you actually may want to be careful about dropping such spoilers! Thanks! Lol jk its Olivia, wanted to see what would come up! ok guys chillax drew doesnt want a war going on if u want to talk about relationship between the characters go to a harry potter chat room its soo anoying!! geez!! hermione-well then u no the solution dont u!! u got this scene perfectly! How quaint this photo is. I love it how Ron liked Hermione way back.